Freshwater fish habitat quality has come under many threats, including nutrient loading, water diversion for agriculture, and contamination, among others. In addition to these more immediate concerns, climate change is a very real issue for fish habitat. Warming global temperatures have been observed to cause changes in aquatic habitats, and especially inland lakes. Many researchers have theorized what future changes in these systems might look like. Expectations include increased nutrient concentrations, lowered water clarity, changes in zooplankton communities (representing an important food source for many fish), and shifts in fish growth and spawning. Unfortunately for future fisheries managers, many of these expectations are littered with question marks. We simply don’t have many contemporary observations of lakes with major temperature increases. Mulhollem, Colombo, and Wahl (2016) recently conducted research to address these concerns and answer a key question: how do artificially warmed lakes differ from natural ones? 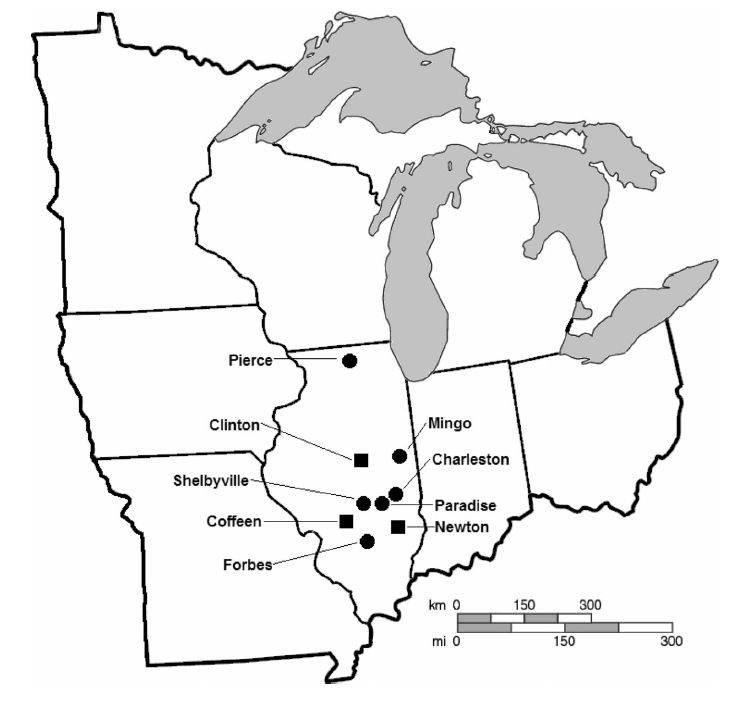 These researchers collected data from 1997 to 2010 on a total of nine Illinois lakes to answer this question (see map). While six of the lakes experienced no artificial warming, the remaining three received heated effluent from existing power plants and, as a result, had temperatures 2°C to 6°C warmer on average. The researchers collected a whole slew of data on these lakes, to capture system-wide effects of warming on lake habitat. Temperature was regularly measured. Researchers also measured water chemistry, including both phosphorus and chlorophyll concentrations, as well as water clarity. Plankton tows were conducted to examine possible differences in zooplankton community composition. Finally, both larval and juvenile fish were sampled to look at differences in both spawning behavior and fish growth. Mulhollem et al. (2016) found that the actual differences between the warmer “treatment” lakes and cooler “control” lakes did not always meet expectations. Water chemistry and water clarity did not vary consistently between warmed and un-warmed lakes. Researchers did observe, however, a sharp difference in zooplankton communities between lake types, representing a difference in food quality for some fish. 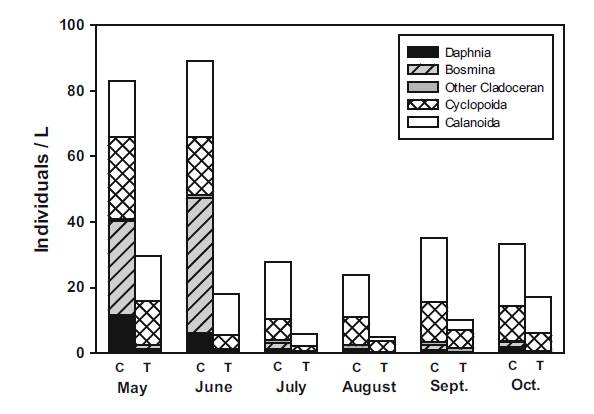 The warmed lakes showed lower zooplankton densities, driven by low densities of a normally abundant taxonomic group (see figure below, left). Fish responses to warmed lakes differed by species. Some species, like Gizzard Shad (Dorosoma cepedianum) and Largemouth Bass (Micropterus salmoides) showed evidence of earlier spawning, while others like Bluegill (Lepomis ma crochirus) did not. All three of these sampled species did exhibit increased growth rates, particularly Largemouth Bass (see figure above, right). These results reflect the complexity of real-world warming scenarios. While lake ecosystems have been observed to respond to a warmer climate, they may not change as expected, and the response will most likely vary from lake to lake. Further empirical work is needed to better understand these changes and how they might affect inland fish populations. New studies on artificially warmed lakes, either warmed incidentally by humans (like the power plant-warmed lakes in this study) or for the specific purpose of understanding response to change, represent the logical next step in predicting these future responses. Mulhollem, J. J., R. E. Colombo, and D. H. Wahl. 2016. 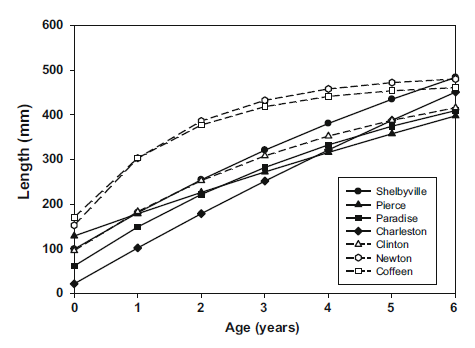 Effects of heated effluent on Midwestern US lakes: implications for future climate change. Aquatic Sciences 78:743-753.